Nibbles in Neopia: A whole Neo-World of food! Let's face it, folks, sometimes it's just great to grab a meal without having to do all the hard work yourself. So, here's a guide to eating in Neopia, for the Neo-rich right the way through to the Neo-"pointless". Sorry, sorry! The unwealthy deserve to eat too, so let's start off with some yummables available just for you poor, poor people. We all know life in Neopia starts in Neopia Central, so it's easy enough to get to our first joint: Soup Kitchen. Just be careful on the stroll down the busy West Central Walk; it can be rife with other unfortunate people heading the same way, so mosey on through the bustling bazaar, remembering to avoid the snake oil quack at the "wizard's shop" and head into the lower west corner of the marketplace. Never be ashamed of visiting the lower central markets; even the Neo-Billionaires started out here. Our trusty Neopedia states: "it's nothing fancy but it's free" - making the Soup Kitchen very popular! The Neopedia also comments on the Soup Faerie's artistry; she only ever uses a wooden spoon to preserve the flavour and "the canisters on her shelves have no labels as all the ingredients are secret" - so no matter how tasty it is, you can't make it yourself! We have heard rumours that people are smuggling out servings of her amazing dishes and selling them on the black market, but reheated is never as good as fresh. It's always best to book in advance at "TSK", as even though 584,390 bowls are served daily, this popularity and exclusivity of recipe raises massive queues waiting for a table. "Two in a Bowl Mushroom and Chokato - wow!" If you're too fussy for soup, then perhaps you'd like the healthier side of life, with tasty, tasty broccoli. The Neopian Health Foods Store is the eatery for you! A restaurant cleverly disguised as a massive broccoli stem to put off the less healthy pets, this Quiggle-owned bistro offers a delight of fresh vegetable based treats and, of course, their famous specialty: Organic Broccoli! Mmm, a "delicious treat for health conscious pets". Veg, the owner and chef of Health Foods, has created some extraordinary calorie-careful combinations, such as their famed “Cheese and Onion Baked Apple”, a mix of sweet and sharp, mellow and bold flavours! On the other hand, if you despise green stuff even in all the shades it has to offer, then why not try Hubert's Hot Dogs for a fast, flavourful snack? As you've probably guessed from the name, Hubert works with a range of shocking toppings on your standard American-style Frankfurter. My personal recommendation would have to be the Tarragon and Brie Hot Dog - a little pricier than your average dog, but certainly smarter than your average bear. Uh, I mean, tastier and less likely to make you ill than the Double Dung Hot Dog. The service is fast and fun – but what else would you expect from Myncies? After all, when two hands aren't enough, they have extra opposable digits and a nifty tail! Thankfully, next door is the Smoothie Store – just right to wash away that mmm-processed-meat taste. Power Shake has developed a variety of curious concoctions, from the classic Splime Smoothie that sent the Smoothie Store rocketing into stardom at first opening, to the new Shepherd's Pie “with real mashed potato flavour!” to really catch you off guard and surprise your taste-buds! If all those smoothies have chilled your mouth, let's warm your taste-buds back up again with a fresh Bakery bite from the Breadmaster! This Italian bread-based chef creates a range of splendid dough goodness – so don't forget to try some! His star offering is the Rainbow Doughnut, all topped with rainbow icing and sprinkles, super colourful. There we go, all this salivation for sweet stuff calls for a trip across the bazaar to the Chocolate Factory! The strange, bearded Kiko owner, literally taken from the pages of a faerie tale, watches over the production of wonderful sweets, lollies and gummies. You can get nearly all of your favourite Neopets recreated in chocolate or gummy. You can even wreak revenge on Balthazar by slow torture: pulling his legs off, biting off his head and chewing him all up – yum yum! Neopia City has just the one quirky food store – but Neopian Fresh Foods offers everything for everyone, foods to suit all, rather than just hamburgers as the kitsch outside might suggest. Here, they proudly boast that you can buy three times as much as any other food shop, and the Chia Chef offers impeccable service alongside the fresh fruit, super sandwiches, perfect potatoes and more! Now we've explored what Neopia Central has to offer, let's be a bit braver and take the ferry over to Mystery Island Harbour. Let us not dilly around places we know, or dally round places like those we know: let us launch into the heart of the mystery – and there's nowhere more mysterious than Pango Pango's Cooking Pot. Except maybe Lutari Island. You should also try the Tropical Food Shop whilst you're here, as the ornate Techo shopkeep offers you “Tropical fruits and fishy delights straight from the isle of wonders!” As with any exotic fruit, the first thing you have to do is wonder how to eat it. Or whether it's safe to eat for that matter... I don't think anyone has worked out how to eat a Gurney Fruit yet, although they still remain a very popular purchase. The Neopedia says: “Gurney Fruits have an incredibly hard shell so nothing can come along and take a big bite out of them.” I'm pretty sure they're called Gurney fruit after the faces you pull trying to work out how to open it. If being under water isn't your cup of tea, but you'd still like to enjoy an oceanic culinary experience, then why not scrape together a handful of dubloons and walk the plank over to the Golden Dubloon. Please note, you DO have to have a tough stomach as you have to have all three courses, but when you're offered delights by the beautiful Loretta Fontaine, such as Forbidden Plunder, well, how could you turn down “more chocolate than you can possibly imagine”? It can get a little rough in here, as with any grog-swilling, pirate laden bar, but the food is well worth the rough and tumble on the way in or out. From here, you can easily take a sloop (or swim, if the Cap'n didn't like you) over to Exquisite Ambrosia, an all-Altador store! One of the most famous Altadorian sayings is “You don't eat anything in Altador without making sure it looks good first”, so it's a good idea to try out the Well Decorated Meat. If you're on the way to a Yooyuball tournament, why not try some Doric soup with Ionic bread on the side. All should admire such fancy food as this bread, elegantly scrolled at the tops of each doughy column. There's even suggestions that stale loaves were too pretty to throw away, so they used them for building some of the newer monuments. Not got enough olde-worlde goodness yet? Why not try Meridell's Meriacre Farm for their Neo-renowned Pick Your Own? It's about the only place to eat here, until you get to Brightvale's Berry Shop anyway. Mind you, I have sneaky feeling they're from Meriacre Farm, but at least you're guaranteed to get what you pay for, rather than paying 400 NP for one Half-Eaten Berry. Oh, and the service is better too. However, hold your rumbling, unsatisfied tummies just one moment and head across land to the beautiful, mountainous Shenkuu, for here you can find Neopia's easternmost restaurant perched high on a scenic waterfall plateau, with a range of exotic multi-oriental based foods, such as steamed artichoke dumplings. I'd personally go for the chokato dumplings and hot mustard sauce; the tender aroma mixed with the scorching spice of the sauce is unmissable for any connoisseur worth their salt. And their soy, oh and wasabi. Mmmmmmm! The delight of Shenkuu is that you can then catch one of their marvellous, brightly painted flying ships out to your next destination, and there's nothing better than flying out with style, other than flying out with style AND a glass of Shenkuu chocolate milk! Your next closest ship-landing spot is the Haunted Woods, but this might be worth avoiding, as the only food available is at the abandoned fairground, where they state: “If it croaks, flaps, or slithers, chances are you can buy it here! Yummy!” Do you really want Mashed Eye Potato? Even the Slime Sundae comes with a notice saying “This really doesn't look like something you should eat.” If I were you, I'd keep on going until you reach the sunny land-shores of Sakhmet. Once you've developed a taste for ancient foods (and it can take some time, some even say thousands of years, which is a good job if you do, as by this time ALL your food would be ancient), then it's worth heading over to Tyrannia, trotting up the stairs of the Stone Chomby and pulling up a rough hewn rock chair for a good slap-up meal. Some of the dishes can be a little dubious, but if you like BIG portions of MEAT then be sure to try the Bargasaurus steak; it has the flavour of banana and melon! Those with few points, take heed, for Tyrannian culture isn't money-based at best, and you can pick up a tasty free bite to eat at the Giant Omelette over on the Plateau. Ah well, the next best thing of course would be a nice chilly Slushie. Thankfully you CAN buy these at the Slushie Shop, ideally located in the coldest corner of the valley, inside the finest igloo around. These treats are perfect if you like smoothies, but they just aren't cold enough for you – the Slushie Shop released an awesome range of ice cold brain freeze, including the so-cold-it-shivers peanut butter slushie! Your culinary desires still not sated, even having tried just about everything Neopia has to offer? Oh dear. Well, it's a good job I have out of these world options for you to try! You can find regular shuttles up to the hangar of the Virtupets Space Station, and a quick elevator trip to the Recreation Deck can get you access to Grundo's Cafe. Grundo's is your average space-worker's greasy spoon. Though to call Gargarox a greasy spoon chef would be a big mistake for two reasons. Firstly, Gargarox is huge. I mean proper big and green and scary huge. And secondly, even the finest cooks of Neopia cannot get the sugar coating to stick to Roast Gargapple quite so neatly or tastily! If even that is too Neopian based for you, then try a quick hop to our moon, Kreludor. “Grundos Cafe? Bah that old dump! Cafe Kreludor is MUCH better,” shouts the orange Grundo as he wields his fish slice over a fresh batch of Kreludan Wiggle Cookies. It's the only place in Neopia and Space that you can find the elusive Kreluberry... Also, taking a bouncy low-gravity trek across the moon's surface, you can find the Neocola Machine. We're not sure quite why it's here, but if you're lucky enough to have acquired a Neocola token, you can redeem it for Smite, Minion Maid, Mountain Poo and other weirdly familiar brands. There's even rumour that there's prizes! However, the Alien Vending Machine (also known as the Nosh-O-Matic) is ideal for getting offworld oddities for pets more likely to get rocket-sick. 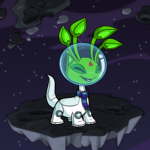 The Alien Aisha itself says that its machine “will give you the loveliest foods in the world.” A slight drawback is that the only currency it accepts is the extremely rare Nerkmid and not everything you get is edible. But rumour has it you can get a really cool Pirate Paint Brush if you're lucky! Just, don't try to eat it. And there you go – a tasty trip all round the world, and then some! The scoop on Neopia's greatest sights to see. Maybe a problem that shouldn't exist.